APA-Monrovia (Liberia) — The Global Logistics Services Inc. and the National Aviation Services (NAS) have broken ground for the construction of a new 2,700 square meter cargo terminal valued at US$11 million at the Roberts International Airport (RIA). APA-Accra (Ghana) — Ghana has moved up three places in the latest FIFA rankings released on Thursday. How is Sierra Leone faring under new president? 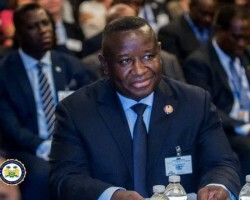 APA-Freetown Sierra Leone) — Sierra Leone’s President Julius Maada Bio marked the first year anniversary of his presidency with a visit to an orphanage in the capital Freetown, setting off a debate about the performance of his administration since April 2018. APA-Freetown (Sierra Leone) — After an unusually protracted screening process, Sierra Leone’s parliament on Thursday finally approved the appointment of five officials to serve as Commissioners of the Commission (HRCSL). APA-Accra (Ghana) — The leader of the Ghana’s largest opposition National Democratic Congress (NDC) party, Mr. John Dramani Mahama has slammed the ruling New Patriotic Party (NPP) government for what he called propaganda over the ailing economy. APA-Freetown (Sierra Leone) — Sierra Leone’s President Julius Maada Bio has appointed a new head of the country’s prisons, ending months of infighting over who succeeds the former head.